Afroz Shah is an India-based environmentalist and lawyer who is leading the environmental movement in the city and tackling plastic pollution and other harmful concerns one step at a time. Shah started the biggest beach cleanup project in Mumbai, Maharashtra, all by himself in 2015. Heartbroken after seeing the Versova beach near his house filled with garbage and all kinds of trash, Shah decided to take matters into his own hands – literally. He along with a senior neighbour started picking up garbage from the beach everyday. His efforts received tremendous attention and worldwide support, along with an increase in volunteers by thousands comprising of youth, slum-dwellers, entrepreneurs, Bollywood celebrities, professionals, and seniors. A shocking amount of 15 million kilograms of decomposing trash and plastic was collected from the 2.5 kilometre stretch of beach over a period of 21 months. 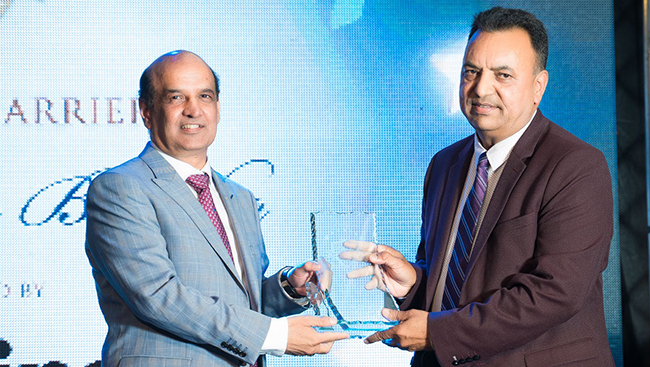 United Nations labelled the campaign the “world’s largest beach clean-up project.” United Nations Environment Program (UNEP) honoured Shah with the Champion of the Earth award for his work in organizing community-led clean-up efforts. Shah and his dedicated volunteers are also cleaning the mangroves and simultaneously working on other environmental concepts that aim at tackling plastic pollution and safeguarding the environment. He is also working with commercial establishments and teaching restaurants owners to be more plastic-free. The social activist is also mentoring around 60,000 kids and getting them involved with his projects. Shah was also CNN-IBN’s Indian of the Year in Public Service in 2017 and has received various accolades for his efforts. The inspiring environmentalist’s good work is creating a ripple effect. Beside Mumbai, cleanup campaigns are taking place in various parts of India as well. He vows to continue his beach clean-up crusade until people and their governments around the world change their approach to producing, using and discarding plastic and other products that wash up onto beaches all over the world. Stephen Sander founded Hollyburn Properties in 1974. Hollyburn is an innovative industry leader responsible for elevating rental housing standards across Canada. Using this platform, he continues to give back to the communities in which his business operates. As a survivor of the Partition of India and Pakistan in 1947, Sander is guided by steadfast resilience, courage and an unwavering drive to do better. His early career began in teaching physical education, which lead him to Canada where he later transitioned into real estate. Sander went from flipping single family homes after school to running the largest privately owned high-end rental portfolio in Canada. Today, Hollyburn Properties operates across the country and houses over 10,000 people. Sander endured many hardships as a young man but the memory of small acts of kindness has always stayed with him. He realized that by funding improved medical technology in hospitals he could positively impact the lives of thousands of Canadians. To date Sander has made several large donations including: $1 million to Lions Gate Hospital Foundation to bring new state-of-the-art MRI technology to the Radiology Department at Lions Gate Hospital, $1 million to Vancouver General Hospital for a new robot-assisted surgical system, $1 million to UBC Hospital for new MRI technology, and $1 million to bring a Minimally Invasive Surgical (MIS) Suite to South Shore Regional Hospital in Bridgewater, Nova Scotia, the origin of his Canadian journey. A man of dignity, perseverance, and bravery, Sander is fueled by compassion and will continue support improving medical technology across Canada as the company grows and diversifies. Gill has been named one of Canada’s 100 most powerful women, Vancouver Magazine’s “Power 50”, Community Catalyst by the Greater Vancouver Board of Trade and listed as one of The Globe and Mail’s 10 Women Who Matter in Film and TV. She brings more than 20 years of experience from the digital media and entertainment industries to her current role as CEO, where she is responsible for delivering a wide range of programs and services that will expand BC’s creative economy to reach its economic and creative potential both at home and globally. Before Creative BC, Gill spent eight years with TELUS, most recently in the role of Director of Production and Original Programming. Her commitment to the advancement of BC’s creative economy can be seen through her achievements there, including the successful development and launch of the StoryHive program and TELUS’s Optik TV community channel. For many years, Gill has championed Canadian creativity as a representative and spokesperson to media, industry and government at all levels. Previous roles and responsibilities have included government and regulatory affairs, independent media consultation, cross-platform marketing, communications, research, public affairs and multicultural programming. She is currently Vice-Chair of the National Screen Institute and sits on the Board of Directors for Advantage BC and The Actors Fund of Canada. She is on the Advisory Board of the Women in View Festival, and was previously a board member of the Vancouver International Film Festival. Sukhi Panesar is a 24-year-old field hockey player who has played 108 official games for Canada. Panesar made his senior national team debut in 2010. The highlight of his junior career was competing at the 2013 Junior Hockey World Cup in New Delhi, India. That same year, he was part of the Canadian team that won silver at the Pan American Cup. In 2014, he competed at the Commonwealth Games and at the Champions Challenge 1 in Malaysia, where Canada finished second in the tournament that was a qualifier for the Champions Trophy. In 2015, Panesar was a key part of the midfield when Canada qualified for the 2016 Olympic Games via the World League competition, and also captured silver at the Pan American Games. In 2016, he was named to Canada’s Olympic team. The talented hockey player was also nominated for the 2015 U23 World Player of the Year. Panesar will be taking part in the upcoming 2018 World Cup. Veterinarian Dr. Hakam Bhullar became licensed with the British Columbia Veterinary Medical Association (BCVMA) in 1995 and his first clinic, the Atlas Animal Hospital, opened its doors on November 20 that year. Dr. Bhullar opened his clinic, his home, and his heart to Indo-Canadian vets arriving in Vancouver. He was quickly recognized as a reasonably priced, honest, and very talented doctor. Not only were other veterinarians in the vicinity of Dr. Bhullar’s clinics unhappy with his presence, they wanted him and all of the Punjabi vets gone. In an effort to curtail further licensing of immigrating Indian veterinarians from Punjab, the scheme of an English Proficiency Exam was implemented in May 2004. This was intentionally made and virtually impossible to pass so as to stop the “pipeline” of veterinarians from Punjab. In June 2004, a huge public demonstration under Dr. Bhullar’s leadership at the office of the BCVMA ensued with a large media uproar. The Association continued their harassment of Dr. Bhullar including unscheduled surprise inspections. On April 1, 2009, the BCVMA clearly admitted their first step of defeat when they wrote on their website that there was “no need for the English Proficiency test,” but not before spending millions of dollars of taxpayers money defending their position on this unnecessary and clearly racist attempt to stymie the lively hood of many innocent men and women. After a Human Rights complaint was filed, there were numerous threats against Dr. Bhullar to stop the HR proceedings; his license was also revoked. On October 8, 2015, after more than 10 years and at a financial cost of $1.7 million and a personal toll on him and his family, Dr. Bhullar was finally vindicated. He was cleared of any and all charges laid by the BCVMA. It was clearly stated by the Judge that the BCVMA was guilty of “Systemic Racism” against Dr. Bhullar and the other veterinarians who had participated in filing the HR claim with him against their Association. Dr. Bhullar got his license back January 29, 2016 and currently practices at the Atlas Animal Hospital. Jaswinder Singh Bains, more popularly known as Jazzy B or Jazzy Bains is a Punjabi language Bhangra singer-songwriter who has released 11 studio albums and collaborated on many tracks. He is a transatlantic superstar who has introduced a fresh new image to the world of bhangra music. Since his debut, Jazzy B has become one of the most important names in the Punjabi music world of modern times. He has acquired the tags of the Original Folkston, the Canadian Sensation, and the Crown Prince of Bhangra and continues his revival of bhangra while wooing audiences across the globe. Jazzy B is one of the most prominent stars of Punjabi music in the 21st century, having proved his credentials with a string of worldwide smash hit songs including Ghugian da Jorra, Dil Aah Gey Ya Tere Te, Londono Patola, Husna di Sarkar and most recent the Gigantic anthem Naag. He is seen as a Bhangra style guru by thousands of fans worldwide including many in India who emulate his pop looks and likenesses. With massive support and interest from across the globe, Jazzy B hopes to take bhangra, both traditional and progressive, further and further beyond. Guru Nanak’s Kitchen is a Sikh-faith led volunteer organization working for the benefit of all communities. The organization’s objective is to enrich people’s life through the principles of Guru Nanak Dev Ji by earning an honest living (kirat), sharing (vand shakna), and selfless service (seva), all of which are embedded in the Sikk religion’s spiritual heritage. The Guru Nanak’s Free Kitchen, concept was developed in the summer of 2007 when a group of like-minded individuals got together and wanted to help with feeding those in need in Vancouver and by doing so encourage Sikh youth and organizations to volunteer their time and services. For the Sikh community, this project is not missionary in nature, instead it is an opportunity for them to extend this true Sikh spirit of helping those in need regardless of caste, colour, creed and economic status. 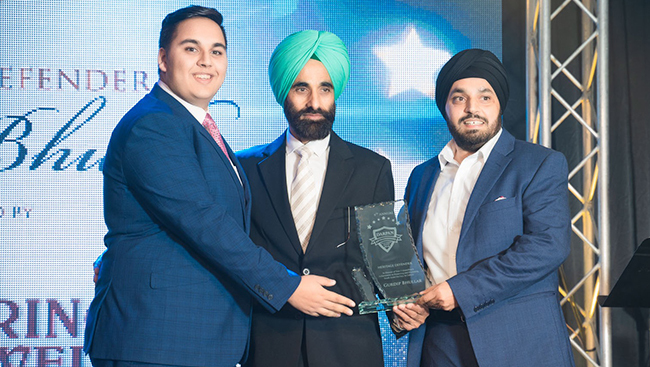 Gurdip Bhullar is the founder of Gurdip Arts Academy, a community organization specializing in acting/drama, and Punjabi arts and culture in the form of bhangra, gidha and singing. Through a YouTube channel, the organization showcases dances, music and plays so that the present and younger generation can have a deeper understanding of Punjabi arts and culture. Their channel has over 13,000 subscribers. Recently recognized as one of the 150 most influential British Columbians by the Vancouver Sun, Shushma Datt may be a pioneer in Canadian Radio, but Vancouver’s top Indo-Canadian broadcaster is just doing what she loves. Naturally inquisitive, Datt began building her name as a broadcaster in the Sixties, a definite challenge in an industry that was predominantly male and pale. As a member of the BBC, she chatted up Mick Jagger and tackled Jimi Hendrix about a controversial album cover that portrayed him as a Hindu god. Today, she’s the owner and operator of IT Media Broadcasting, a company that holds two radio stations: Radio Rimjhim and Spice Radio1200AM and produces multiple TV shows for the Shaw Multicultural Channel and Omni. Datt has received numerous awards, including the Order of British Columbia in 1992. The Queen's Golden and Diamond Jubilee Commemorative Medals, for outstanding contributions to the community. In 2007 Business In Vancouver's Influential Woman in Business Award for her many accomplishments in broadcasting and multicultural programming The YWCA honored her as a “Women of Distinction" in 2006. In 2015 she was awarded the “Rosalie Award “by the Radio Trailblazers. Datt is active in the community, serving on the board of British Columbia's Institute of Technology's Broadcasting Programs since 2007. Today, she continues to produce quality content for Vancouver’s South Asian community and is grooming Vice President and son Sudhir Datta to take over the company. Umang Khandelwal recently graduated with a degree in law from the University of Cambridge, having served two terms (2016-2018) on University Council, the highest governing body of the University. She spent a summer at Hootsuite as a legal student, assisting in international expansions, providing contractual support and improving internal legal processes. Khandelwal’s prior degree in International Relations was from the University of British Columbia in Vancouver, where she spent a term abroad at Sciences Po Paris studying economics and politics of the EU, earning a Certificate in Social Sciences and the Humanities. As a Hansard Scholar, Khandelwal worked for a Peer in the House of Lords in London as a legislative assistant, focusing on prison reform for women and increasing the representation of women in politics. She is committed to fostering inclusion in communities, having practised as an anti-discrimination workshop facilitator at UBC. Khandelwal has participated in the WTO’s Public Forum in Geneva, the Council of Europe’s World Democracy Forum in Strasbourg, and the Spring Meetings of the IMF and World Bank in Washington D.C. In 2016, Khandelwal represented Canada in China as part of a five-member delegation at the Y20, one of the official stakeholder groups of the G20, and presented the negotiated policy document to Prime Minister Justin Trudeau. She is dedicated to increasing access to justice for immigrants, refugees, Indigenous peoples and other marginalized groups, and has volunteered with the B.C. Civil Liberties Association and Access Pro Bono. She has been named a Darpan Magazine Newsmaker 2016, Barclays Top 100 Women to Watch 2017, and an RBC Top 75 Canadian Immigrant 2018. 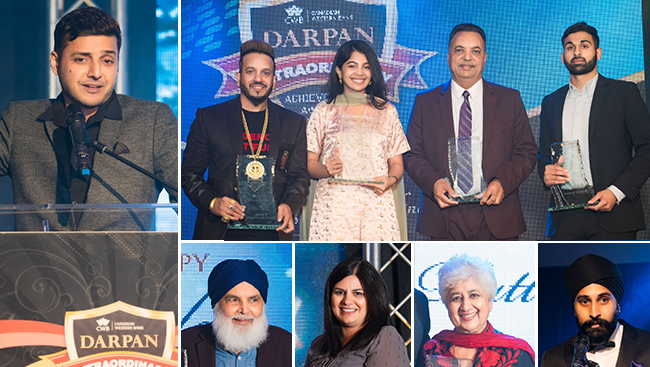 The "Extraordinary Achievement Awards" honour South Asian individuals and/or groups, who have conducted extraordinary achievements in diverse fields and who reflect their heritage in a remarkable way. There are 10 categories from Community Crusader and Breaking Barriers to Advancing Philanthropy and Young Wonder.